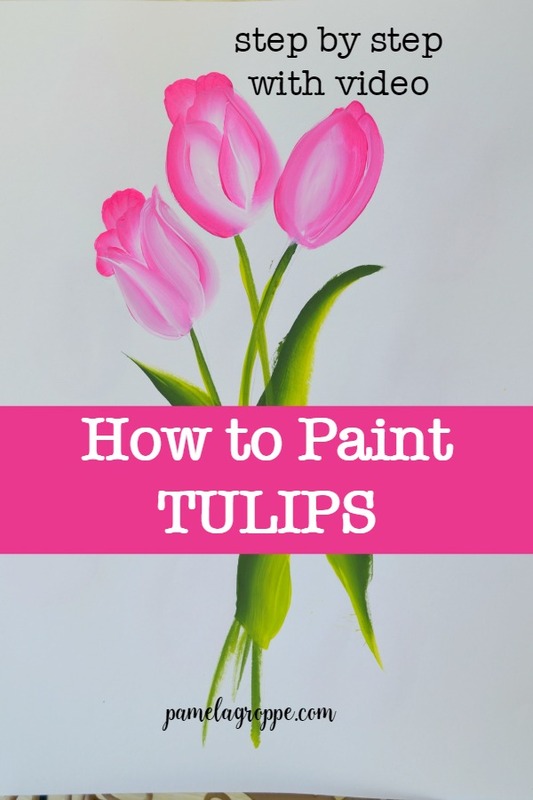 Learn how to paint pink tulips fast and easy. 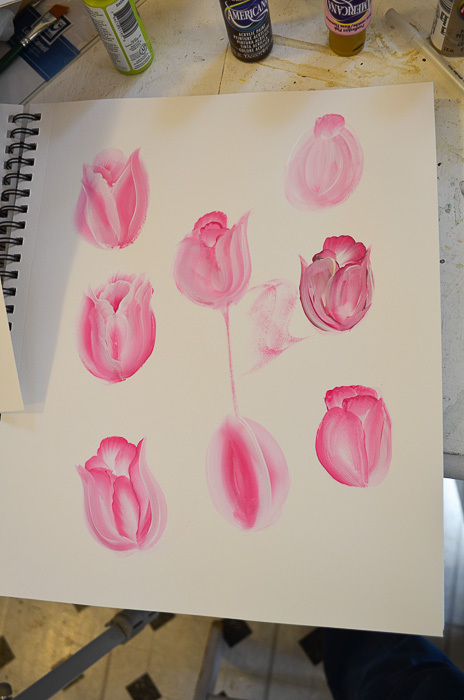 I show you step by step, one stroke at a time how you can easily paint these beautiful pink tulips. 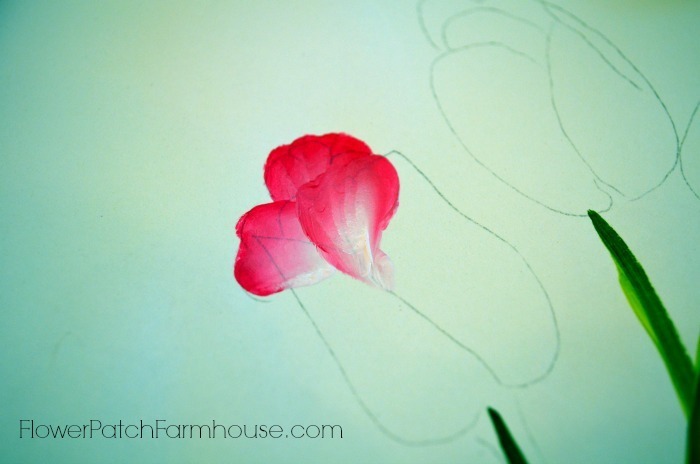 Create botanical art in acrylics! 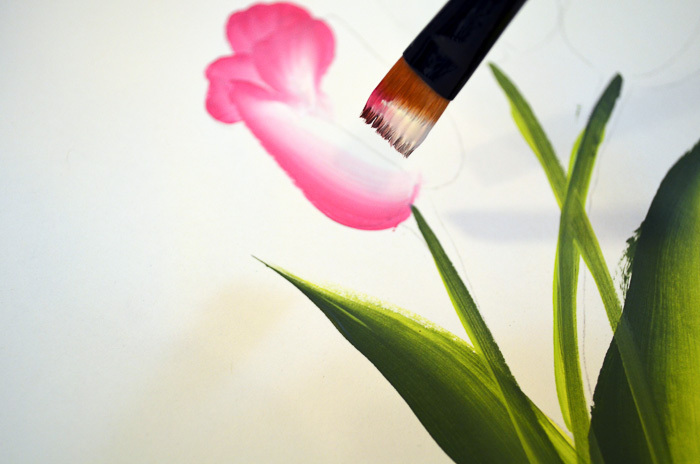 Great painting ideas for beginners. 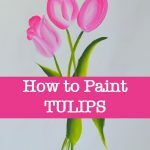 Paint pink tulips, fast and easy, step by step. 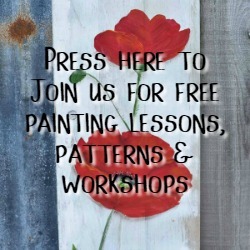 This is one of the very first painting tutorials I create and the video is proof. 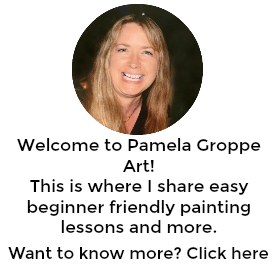 You can easily tell that I was a complete novice at creating videos but I learned so much by just doing and not waiting to be perfect before sharing. You can start with a pattern as I did for the demo but you can also just sketch in some ovals for placement then paint the petals in layers. 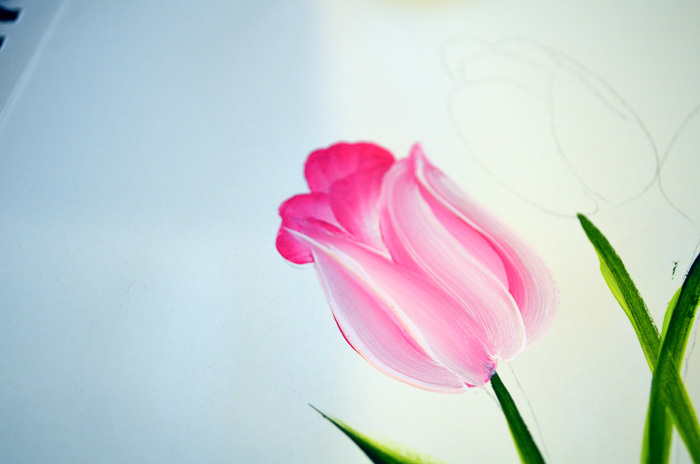 Look at a photo of some tulips and emulate placement of the petals. Remember we are not going for realism but an impression of them. Practice, practice, practice. This is my practice sheet before starting the tutorial. I often do some practice strokes to get warmed up. 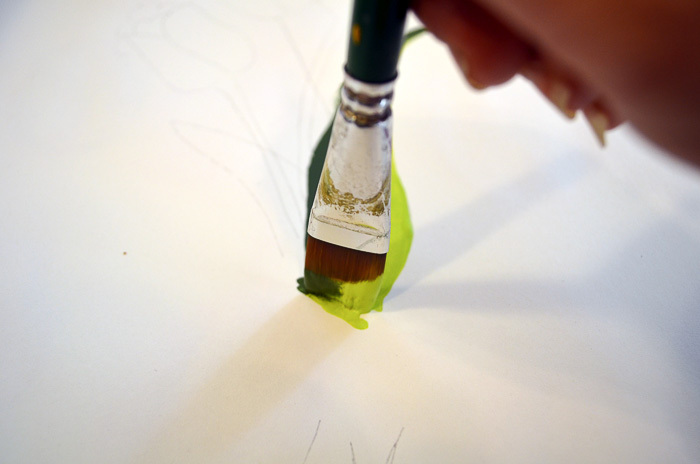 1.Double load the 3/4″ brush with DecoArt Americana Avocado Green and Citron (if you have other colors of green use them, these are just what I used in this demo). These are the back leaves. Start at an angle, drag brush upward while applying pressure. 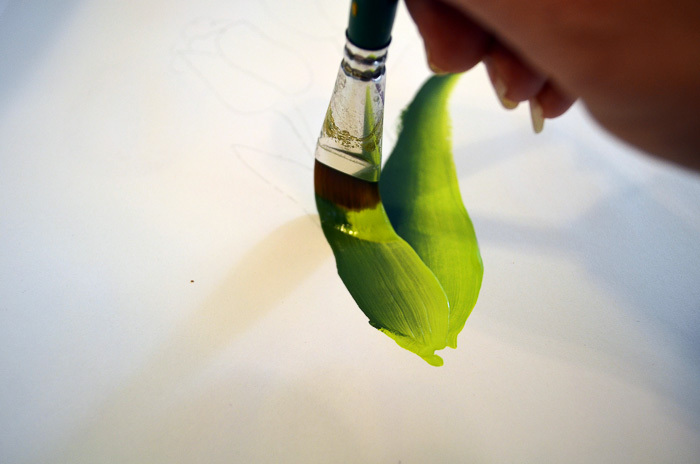 As you slide to the tip of the leaf, turn your brush at an angle and lift to a chisel edge creating a pointed end on the leaf. 2. Start the second leaf slightly overlapping the first. Note how you curve up to the point at the end of the leaf, they are not rigidly straight. View the video for the rest of the leaves. 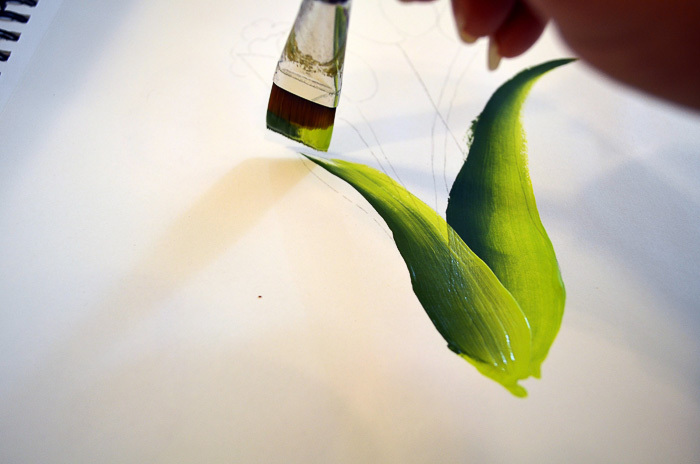 It is easier to see how to do the folding leaf in the video. 3. 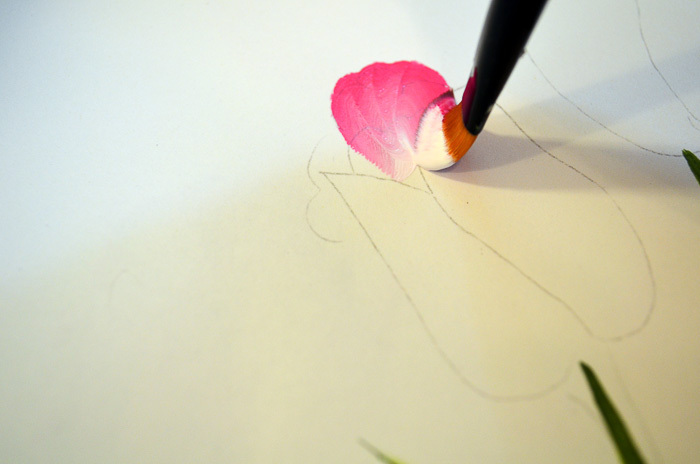 Drag in some stems with the chisel edge of your flat brush. 4. Switch to the #12 flat brush. Double load with DecoArt Americana Royal Fuchsia and Snow White. 5. 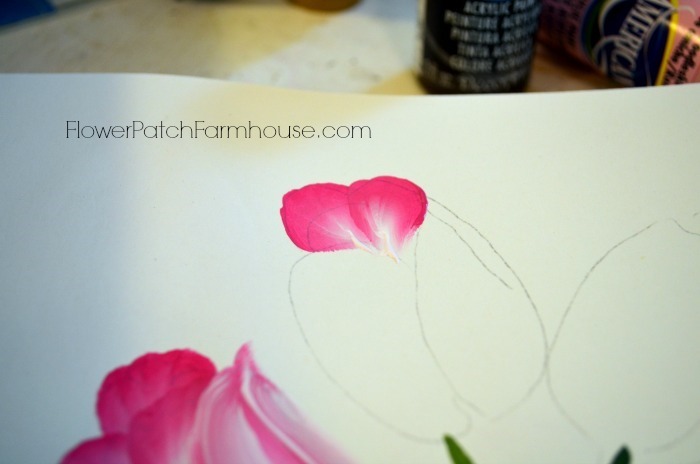 Continue to layer the back petals on until you have what you want. 6. Reload your brush and paint on the front petals. You can do right or left, I started with the left. I stroked up to a point at the top then came back down. 7. 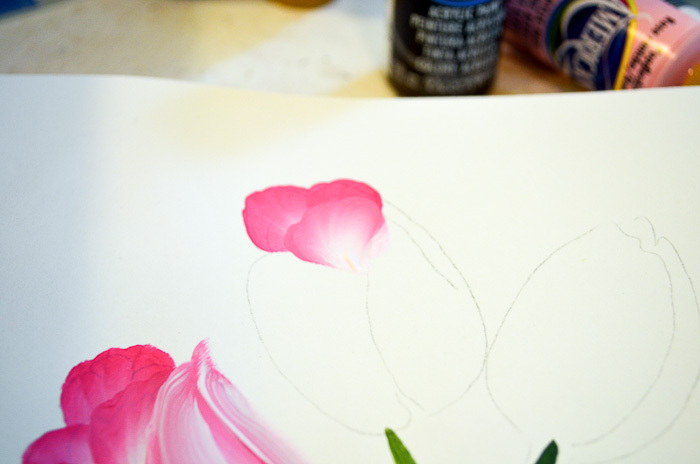 Paint the next petal on the other side. I did some modified S strokes following the contour of the petals. 8. Do the same with the second tulip. 9. Paint the back petals first, then start one the front. Notice I did not bring the left front petal stroke back down as I did the first. For more on the rest of the tulips please view the video.